For more than 20 years, the Coalition and the Nationalists fought their bloody war. With war comes technology, and it developed at an astonishing pace. The two armies fought each other with ever more powerful weapons, yet neither side gained the advantage. Ultimately, the two sides ran out of funds, willpower, and men. As the armies collapsed leaving the country in anarchy, a new power rose. Sweeping down on the exhausted country, PSI's forces obliterated the remaining armies and began its conquest of the East. Now, the Western territories, mostly unaffected by the civil war, find themselves suddenly defenseless against a new and quickly growing east coast power. Damnation features large, open environments where a variety of acrobatics and Hollywood-action stunts are possible. 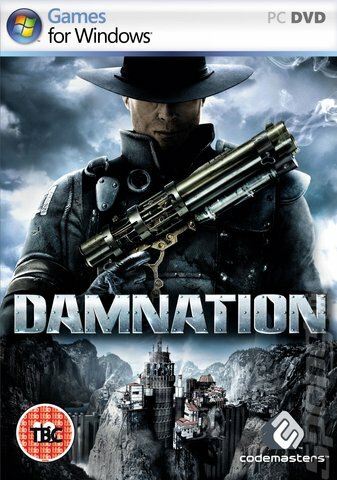 Damnation features verticality which differentiates it from many other games in the genre. Damnation has steam-powered vehicles which are also able to execute various feats of mobility, such as climbing up walls.